This is part two of Ken and my engagement shoot series featuring our engagement photos taken in Scotland. For part one featuring our photos in Glasgow featuring Kelvingrove Park and West End, visit part one. 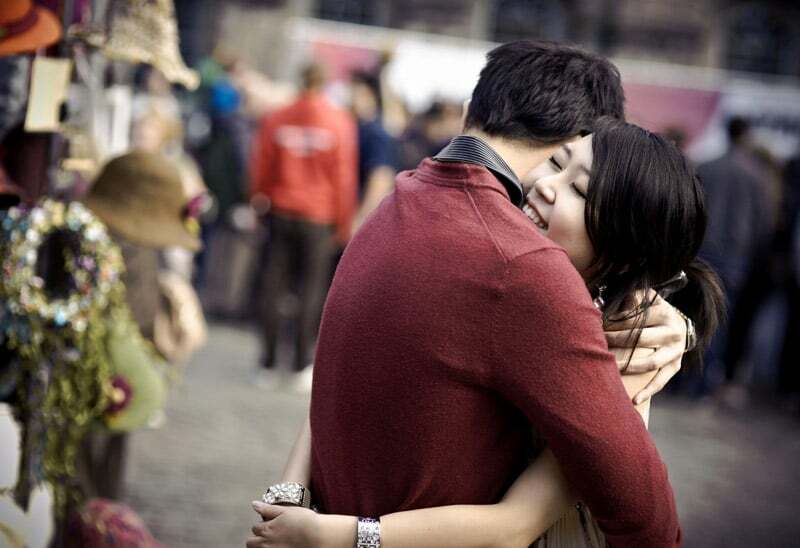 To know how we met and got together: How I Found My Soulmate. For details on the day he proposed, visit: My Proposal. 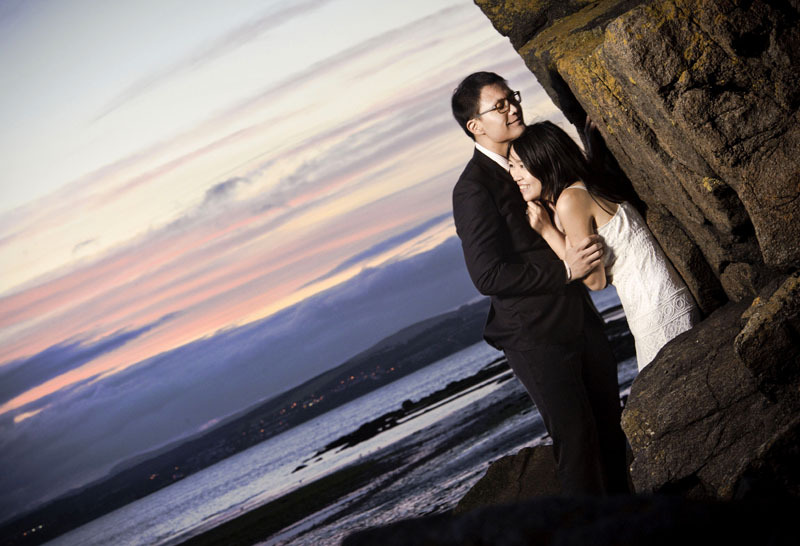 Our Edinburgh Shoot, feat: Tantallon Castle, Cramond Beach, and more! 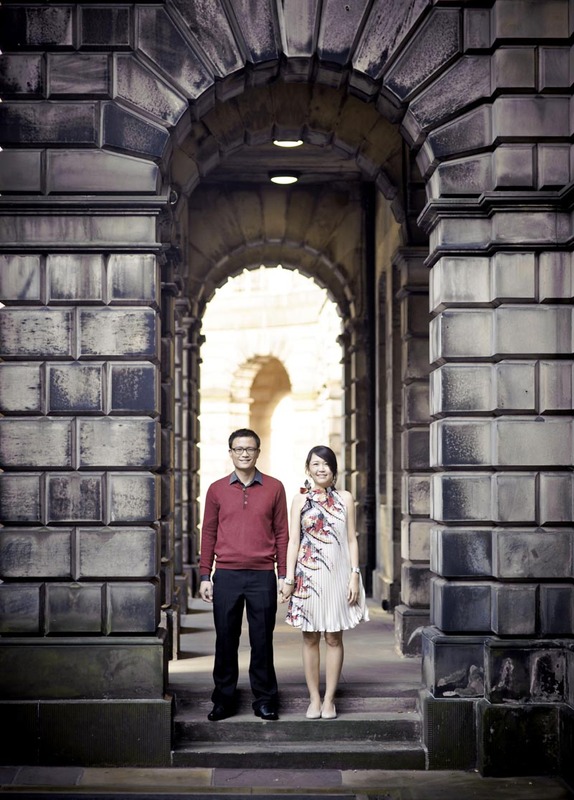 For our Edinburgh shoot, we had the pleasure of engaging Orange Lemur: run by Joanna and Jan, a husband-wife team. Joanna and Jan are Polish but have been residing in Edinburgh for the past few years. 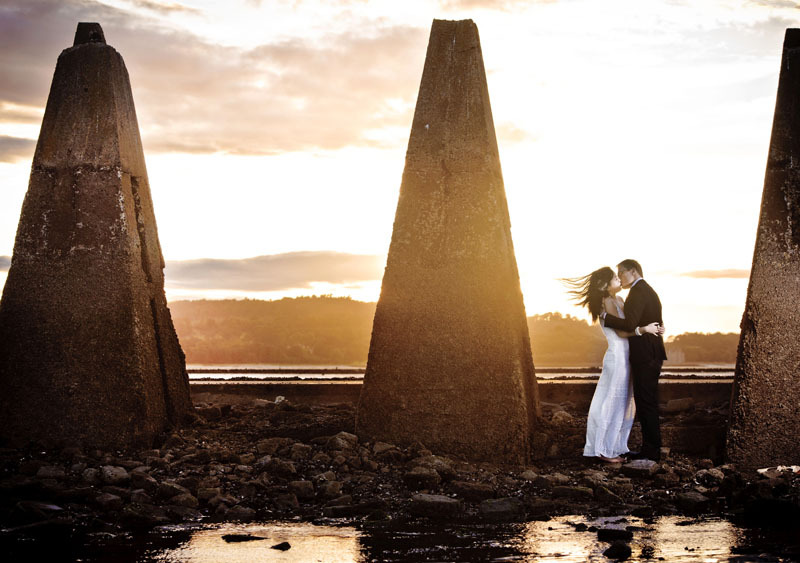 They have been doing wedding photography for five years and know the shooting spots in Edinburgh inside out! When I told them my ideal scenes for our shoot which include castle, garden, beach, and nature spots, Joanna went out of the way to include them in our four-hour shoot (over two days). She recommended specific shooting spots in Edinburgh which was extremely helpful since we were mere tourists with no clue on good shooting spots. Like Neil from Glasgow, Joanna was thoroughly (if possible, more) prompt and patient with my one zillion concerns, questions, and requests. 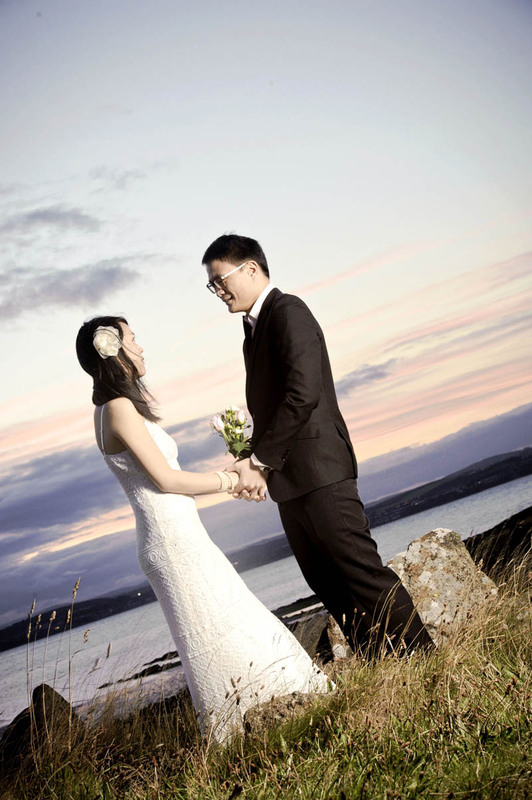 Joanna and Jan even drove us to our shooting locations — some as far as a 40-minute drive away from Edinburgh City (Tantallon Castle) — at no extra cost! Joanna and Jan were very generous with the photographs: they shortlisted and sent us 220 photos from our two-day / four-hour shoot featuring various locations in / around Edinburgh City. 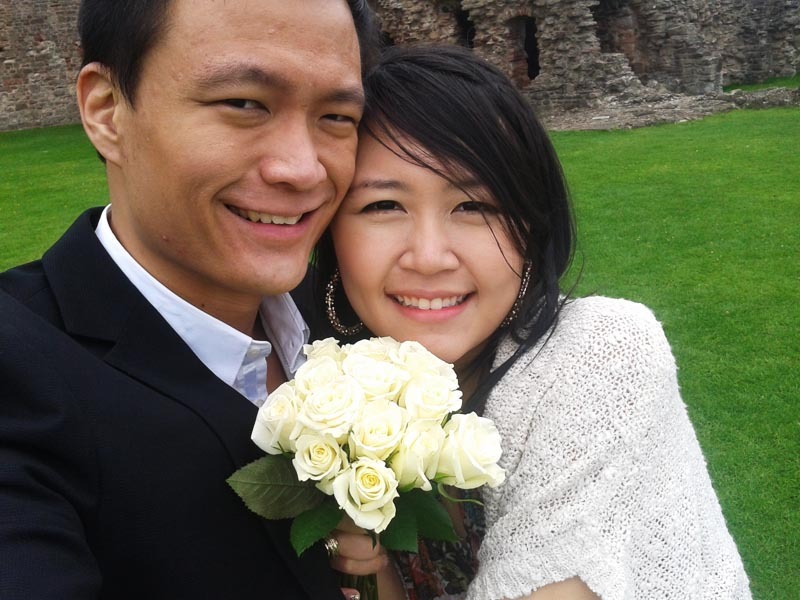 In the end, Ken and I shortlisted 29 photos for our wedding album. Like our Glasgow shots, I made some color adjustments, photographic refinements and minor retouching, but Joanna and Jan definitely take the full props for the wonderful photos. Hand in hand, at St Giles’ Cathedral. 🙂 Really love the colors in the photo. Walking on the streets of beautiful Edinburgh city. I love this shot a lot! Very candid, real, yet dream-like at the same time. Almost feels like we’re floating through the city together, hand in hand. Lovers’ embrace. I really love this one, from the colors, to the emotions captured: everything. Oh, it was the Edinburgh Festival Fringe when we were in town, which is the largest arts festival in the world. That’s why there were so many people in the background! I love that because it adds to the vibrancy of the photo! Chilling at a cafe. Another of our favorite shots. Joking around, haha! I initially didn’t want to include this shot in our album as it looked so silly, but Ken said we should because it’s so natural and funny! And upon further thought, I think he’s right! I love the candidness of this photo; it reflects the frequent laughter and fun we have in our relationship. Sweet and quiet moment in the garden. This was taken at Princes Street Gardens. I love the flowers: they are so vibrant and pretty! In the interior of Tantallon Castle (or what’s left of it). 🙂 Tantallon Castle is a semi-ruined mid-14th-century fortress and it’s one of the castles in the care of Historic Scotland today. Oh, while we may look really comfy and eased in the photos above, the whole photoshoot process was a mad rush in coolldddd weather! About 10–14 degrees in summer wear (as you see in the photos): too cold for a born-and-bred Singaporean like me! Ken had it better since he was in jeans / pants with long-sleeved tops, but he felt the chills too! At the top of Tantallon Castle. I love this shot; so dream-like! What a dramatic shot; we love this one!! This was taken atop the castle. Believe it or not, it was the wind blowing my hair! It was unbelievably windy (and cold) there at the period we were there (August). Half the time I felt like my earrings were going to fly off! (Thankfully they didn’t.) But it was so fun despite the weather challenges! A lazy day on the fields. 🙂 Both of us love this photo because it reflects the sweet, relaxed, and mutual love in our relationship! Easily our favorite in the Edinburgh series! This shot is gorgeous! The scenery, the pose, the look, and everything combined feels like it came right out of a movie set. Beautiful sunset at Cramond Beach. Magnificent location, moment, and shot! If it’s even possible, the sunset actually looked more beautiful in person than in the photo! At the top of the cliff; at the top of the world. 🙂 One of our favorites. Under the beautiful (almost full) moon. I thought this picture is so funny and cute at the same time because of how Joanna and Jan digitally magnified the moon to the point where it’s so big and akin to anime moons, haha! The actual scene was actually a LOT darker than in the picture too by the way: Joanna and Jan lightened it by quite a bit in their post-edits. Final photo: Watching the sun set together — today, tomorrow, and every day, till the day we die. Overall, our Edinburgh photos are different from our Glasgow shots in that they have a touch of drama and boldness, while our Glasgow ones bring out a more casual and down-to-earth quality of our relationship. These are probably reflective of the photographers’ personal styles too. Well, Ken and I love them both. 😀 The pictures shared in part one and this part are our top favorites; I particularly love the piggyback shot (Glasgow), the quiet moment in the forest (Glasgow), the bridge shot of Ken carrying me up (Glasgow), the one with Ken adjusting my flower clip (Glasgow), the closeups of me gazing at Ken (Glasgow and Edinburgh), the epic grayscale shot of us standing on the road (Glasgow), the beautiful and dream-like shot of us walking into the sunset (Glasgow), all the hand-in-hand shots, and almost all the Edinburgh ones (the backdrops are simply gorgeous and accentuated the nature of our relationship). We are also happy we shot with two different photographer teams because we got such a great variety in locations, mood, and styles. We definitely got the best of both worlds engaging Neil and Orange Lemur who have very distinct photography directions. 6 Tips To Achieve Your Best Engagement/Bridal Shoot! Research the photographers first by checking out their portfolios. Different photographers have different styles, and the best way to tell what their styles are and whether they match what you’re looking for is by seeing their body of work: not by hearing what they say. A picture tells a thousand words and that’s especially true here. Many Singapore / Asian wedding photography services I looked up (prior to engaging Neil and Joanna/Jan) had very cheesy and posy portfolios, which weren’t what Ken and I were looking for. It turned out that the Scottish / European photography style is more in line with our preferences, so it all worked out well in the end. Look up reference photos as you brief your photographer(s). I scoured different photographers’ portfolios and the internet for reference poses and locations of what I wanted for our shoot. This helped me to directly convey to my photographers what I was looking for. Again, a picture tells a thousand words, especially when you’re working with photographers!!! Practice taking photos together with your S.O. before your shoot. If your shoot is anything like ours, you won’t have time to think nor check the output for each scene: you’re going to only have one to two minutes top to pose/look good/get a good shot for each scene, after which you’ll be zipping from one place to another (high heels and all if you’re female). So, practice taking photos together as a couple first (if you don’t normally do that) and think about the poses you want to do: especially if you’re planning just one pre-wedding shoot! After our shoot with Neil in Glasgow, Ken and I immediately thought of poses we could have done but didn’t, after which we got them down in our Edinburgh shoot. Bring a pair of flats (for ladies) to easily move from one place to another. Otherwise you may get tired and sweaty from moving around in heels, which will surely show through in the photos! Do quick checks before each scene to ensure everything is in place. From jumbled earrings, to misaligned bangles, to rings getting out of place, to creases in clothes, to flyaway hairs, to makeup wearing off, anything is possible. Makeup can be fixed and so can hair, but the rest, not that much. There was one beautiful closeup shot of our ring which we couldn’t use because the ring was very misaligned; even the ring shot you see in our Glasgow shoot was salvaged after some reconstruction work by me. Make things easier for yourself by checking that everything is in place first! Be camera aware. My experience with video filming (interviews, Celes.TV) and photo taking helped in that it made me more camera aware: I had a general idea of how to pose to get the best visibility and also to get the right look for the photo. I also helped to pose Ken as much as possible to achieve the same. These helped in that it gave us quite a wide selection of shots to choose from in the end. While #3 is about building couple camaraderie in front of a camera, this tip is to about building your own camera awareness. Have someone take photos of yourself so you know how you look on photos in different angles/poses/expressions. Find your best angles/poses for your shoot and learn to convey the right expression for the right look in the shoot. At the end of the day, a good photographer should makeup for gaps in #3, #5, and #6, but in case your photographer can’t fill these gaps (they may have their hands full with other things), be prepared! This is a once-in-a-lifetime shoot, so I want you to get the best out of it! Our Wedding on May 25 next year! 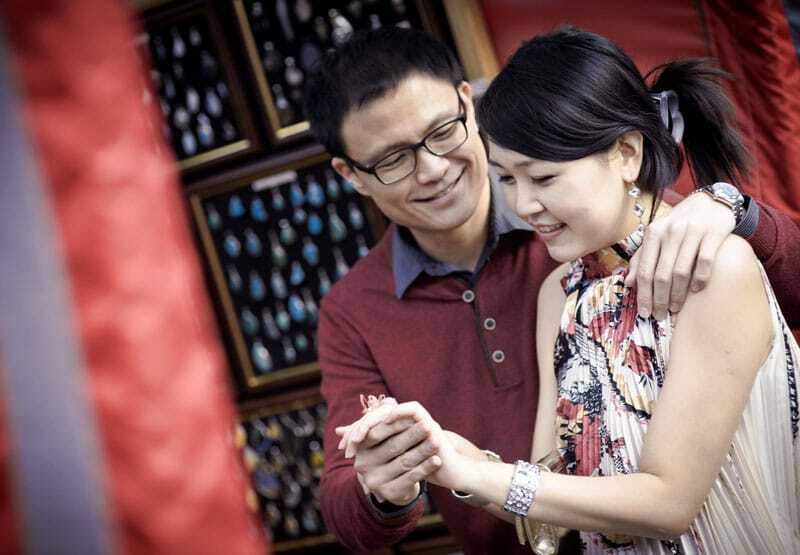 Our wedding date is now set for May 25 next year (2014) and we’re having a Chinese-style wedding dinner banquet at the prestigious Shangri-La Hotel! We decided to make it an exclusive event (compared to original plans) as we only want people who matter the most at our wedding, it being a highly personal day and all! However, I can’t guarantee any seats at the moment because (a) we are going to have 100 people only after all, and (b) that’s 100 people split between me and Ken, of people we’ve known our entire life including family, relatives, personal friends, and childhood friends! I’ll share more details in November/December, so stay tuned!